-Foundation problems seem scary to most homeowners. People tend to point fingers at who built the foundation, but the truth of the matter is that if you have poor soil and your seasons fluctuate (we’re looking at you Nebraska) then you are susceptible to problems like foundation settlement and sinking. Not to mention drought, trees, and sewer leaks only accelerate the process. If you are dealing with foundation settlement, you need foundation repair contractors who does sinking foundation repair! At BDB Waterproofing, we use a technique called piering to correct any foundation settlement. 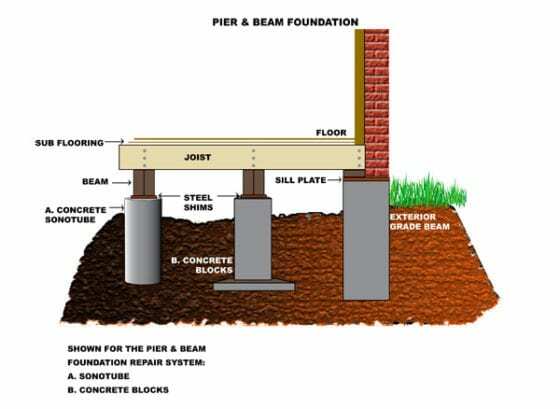 Piering is the technique of driving steel pipe pilings to remedy failing building foundations and to correct foundation settlement. 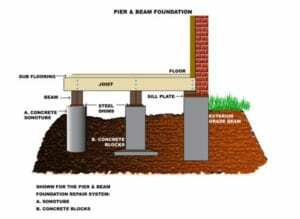 The piers are first driven into a suitable soil layer, next, are connected to the foundation, and then used to support the structure. Hydraulic jacks are finally embedded to the steel piers and are used to raise the foundation back to its original elevation. Now that you know what piering is, how can it help your foundation settlement? Can be an upwards of ten times less than replacing the foundation. The building use continues as normal and piering is non-disruptive. Piering equipment is portable, making it easy to get into even the hardest of places. You won’t have to worry about landscaping as there is no yard destruction. It remedies both the cause of the foundation settlement and the consequences in once step by fixing the unstable soil and leveling out the foundation. If you are seeing signs of a sinking foundation, which include foundation cracks, basement wall cracks, foundation upheaval, or doors that are no longer opening and closing properly, contact us as soon as possible! Waiting out foundation problems can only lead to more problems, which in turn will cost more money. Don’t wait to talk to someone about your foundation. Contact BDB Waterproofing for a free estimate today.